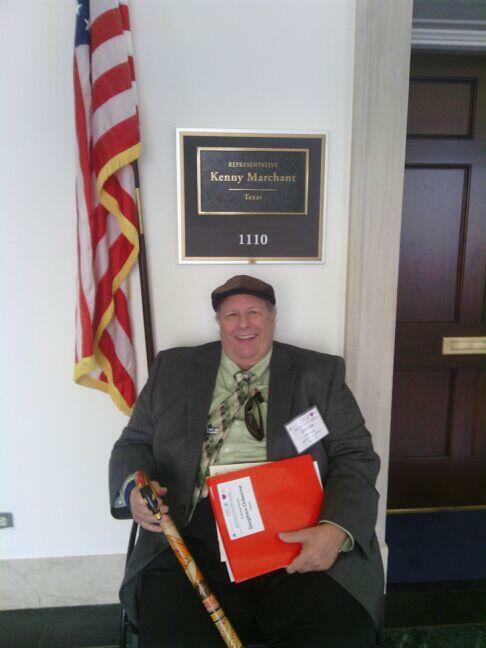 I am back from Washington, DC with the Dialysis Patient Citizens protesting the cuts proposed by CMS to dialysis patients. Over 70 patients and family members and over 60 dialysis facility staff from 49 states (including AK and HI) were on Capitol Hill yesterday. 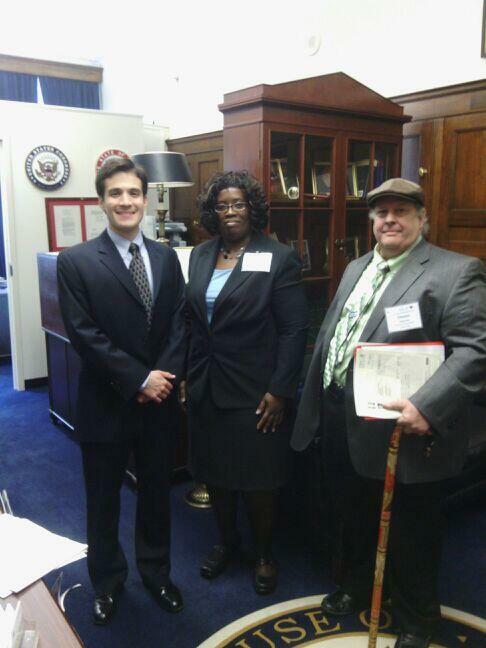 We met with Members of Congress to express opposition to the proposed 9.4% cut to the Medicare dialysis program. We were able to talk to 212 offices! Wow! My friend Jim Myers and I had a chance to meet and chat. Here’s a pic of Jim with one of his Senators in Congress. On Twitter you can join the effort using #StopESRDCuts and by liking the DPC Facebook page. This entry was posted in CMS, dialysis, DPC, ESRD, kidney, lobbying, Medicare, politics, social networking and tagged Affordable Care Act, CMS, dialysis, ESRD, hemodialysis, kidney, lobbying, Medicare, patient, patient care, politics. Bookmark the permalink. Devon, thanks for the mention. Posted everywhere! Can’t wait to read more about your experiences. Will be posting mine later today, be sure to check them out. Some great pix of you! I guess I am opposed — reluctantly — but I was shocked last year when Medicare was way behind on payments and I got a bill for $240,000 for three months of dialysis. I realize Medicare doesn’t pay the whole bill, but that statement helps explain how my Germany-based dialysis company logged $7 billion profit in one quarter last year, and why exhorbitant prices are charged for things like syringes and for drugs that I don’t think I get. Dialysis is a growth industry even with the prospect of subsidy cuts. What is billed and what is paid are two different things. Current payment is about $258 per session. This cut will put the payment to about $230. Hardly sufficient when you consider they are bundling medications into that.